Many early stage companies use alternative economics – often equity – to bridge the gap between what they can afford to pay key employees and their compensation demands. However, these often give rise to complicated legal and tax challenges. 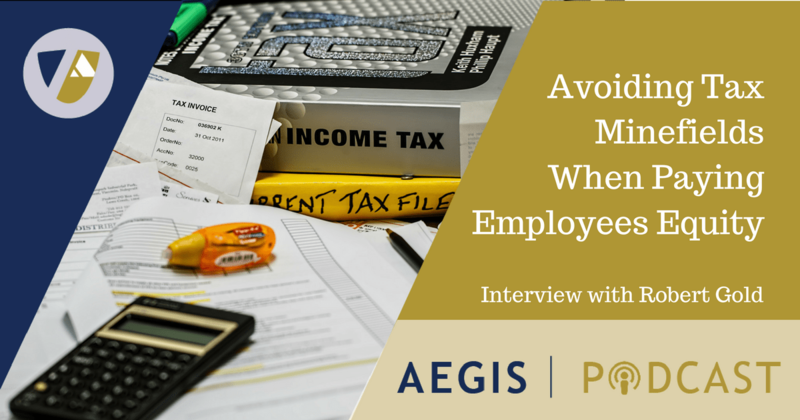 Join Scott Levine as he interviews AEGIS attorney Robert Gold on the legal, practical and tax implications of compensated employees with equity. Robert Gold is head of the AEGIS Chicago office. He has close to 25 years of experience in structuring and executing transactions on both his own behalf and for a wide variety of primarily middle-market enterprises in healthcare, technology, real estate development, manufacturing and intellectual property. Robert’s primary area of expertise involves tax-related issues with a concentration on structuring businesses and transactions utilizing partnerships and other flow-through entities. His legal practice also has involved corporate advice including ownership-transition planning and governance, and the private placement and syndication of securities. Look here for more information about Robert, or email him here.